“Yahoooo,” shouted Johnny as we rode the sand dunes on our 4×4 Mitsubishi ‘surfboard’. He looked at me with his warm, chocolate-brown eyes and we threw back our heads and laughed. Around us was the magnificent desert, a medley of apricot and orange hues, and peeping out between dunes was the sparkling Atlantic. What a ride! Actually, what a morning in the desert! Or, rather, in the LIVING desert, as we had recently discovered. Johnny, the desert guide. Photo ©Ron Swilling. We had just provided a Namaqua chameleon with a feast of toktokkie beetles, leaving the beetle glutton in peaceful bliss as we moved on to crest a dune. Not your everyday chore –we were having a Living Dunes Experience. 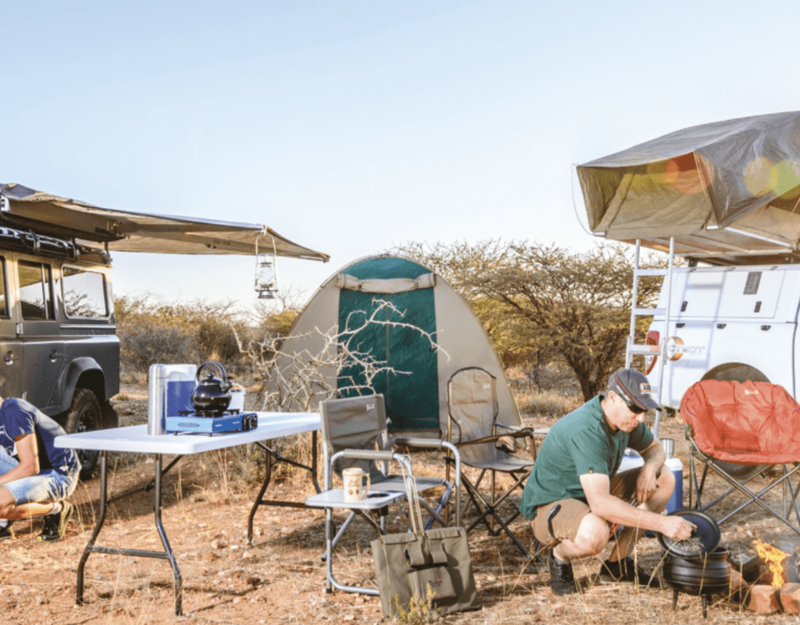 Our journey had started three hours before when a few of us hopped aboard a Charly’s Desert Tours microbus from Swakopmund with our city blinkers firmly in place. Left to ourselves, we would have driven into the treasure house but completely missed the jewels. Johnny Nampungu wasn’t about to let that happen. An experienced desert guide, he spent nine years as a quad-bike guide and another five with Charly’s, and can read a track on a sand dune faster than an American can say critter or lickety-split. We had barely left the town and crossed the Swakop River when Johnny stopped the vehicle. He jumped out and starting digging in the sand. We sat there incredulously while he returned to the vehicle, looking like a dove holding out an olive branch, and set to prove that there is life in the desert. 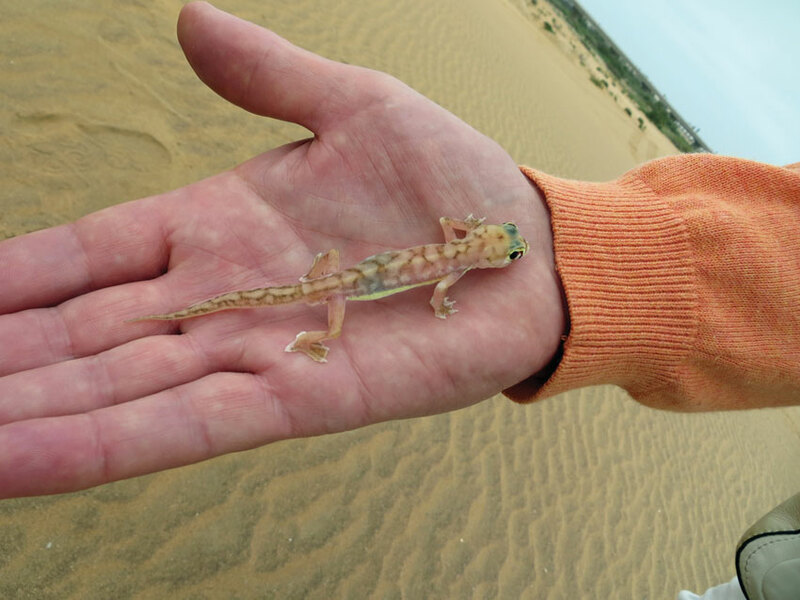 Cupped in his hand was an iridescent palmato (web-footed) gecko, our first jewel of the day. There were more to follow. 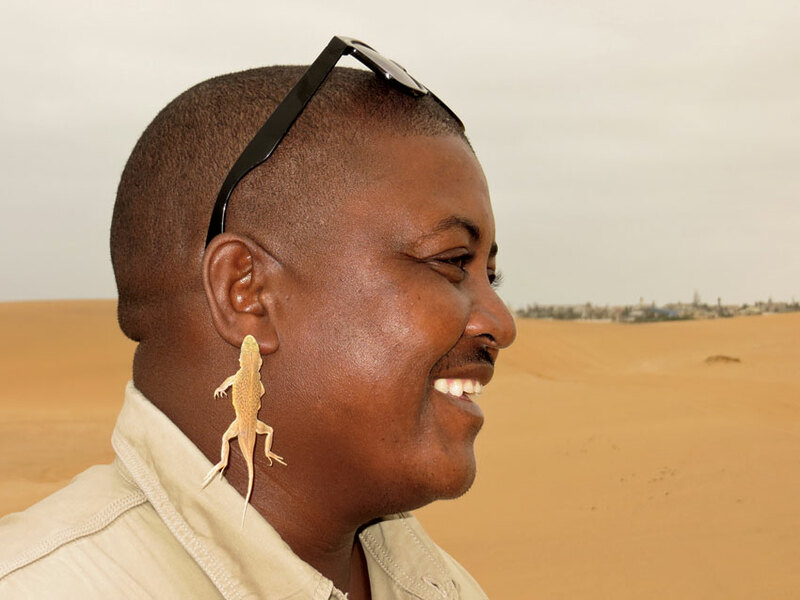 Johnny listed ‘the little desert five’: the palmato gecko, the dancing white lady spider, the sand-diving (shovel-snouted) lizard, the sidewinding adder and the Namaqua chameleon. A few possible bonuses were the legless lizard, scorpions and the horned adder. Although he mentioned that he couldn’t promise we would see them all – that was up to Mother Nature – he would definitely try his best. And we couldn’t have wished for a better guide leading us into the land of milk and honey. Surprisingly, the Namib Desert is not barren at all; it is alive and well. Desert-adapted flora and fauna have made this great and ancient desert their home. You just had to know how and where to look. 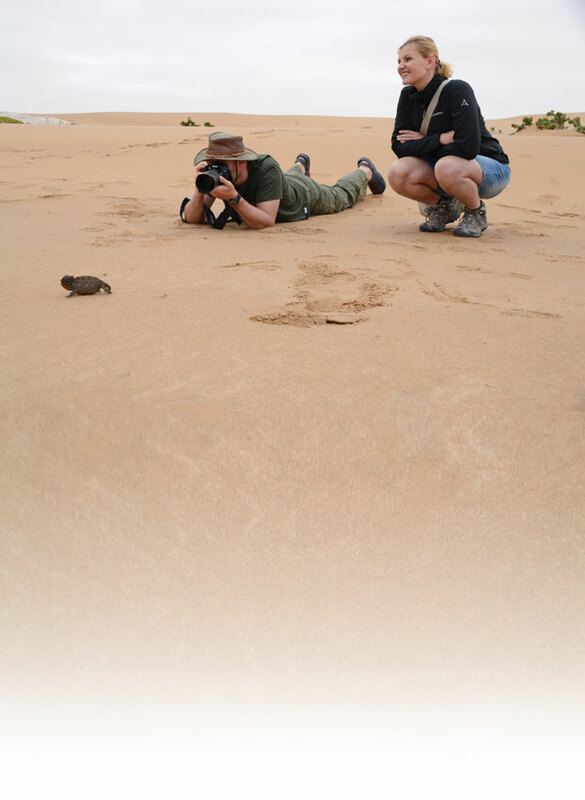 Our intrepid guide glanced at a few marks in the sand, pulled up his handbrake and leapt out of the vehicle, returning with a sand-diving lizard with ‘feathery’ feet. Although Johnny tried to coax it into hooking onto his ear like a desert earring, the little guy just wanted to disappear into the sand, a vanishing trick he could complete in two seconds. This ‘lickety-split’ stuff must be going around. Eventually, realising that his attempts were useless, he obligingly decided to pose for the humans who were obviously wasting his precious time. Then we let him go – and before we could open our mouths, he had disappeared in a puff of dust. I had a few moments to ponder the desert playground that invited us out to play. There were quad-bikers, sand-boarders, horse- and camel-riders, and guests open to wonder, as we were. And play we did. Just as I started to ponder the desert paintbox and how there are insufficient words to describe the colours of the gentle and undulating beauty, the vehicle stopped. A snake trail was visible on the golden dune. But the trail proved cold, so we moved on. Soon after we happened on the small and slinky legless lizard and a disinterested Namaqua chameleon, and Johnny transformed a magnet into a porcupine by running it over the iron-rich sand. Then Johnny’s “Come, let’s take a picture of a snake,” caught our attention. Jackal tracks led to a small dollar bush where a sand-winding snake had survived a near-death experience. It wasn’t altogether spared from our inquisitive eyes though when Johnny spotted the shape of its head in the sand. Using his stick, he pried it from its hiding place, giving it the chance to side-wind, hiss and put on a fearsome display of ferocity before digging into the sand and disappearing again. 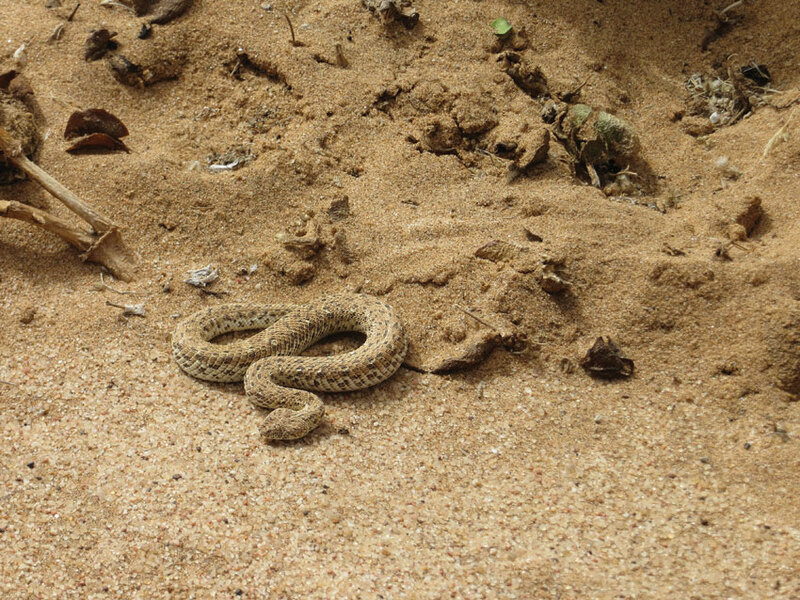 Our luck doubled as we continued on our way and a horned adder was spotted in the shade of a small bush. This venomous snake was treated with more caution. Someone exclaimed how fortunate we were to see two snakes on the same trip. Johnny took the compliment with grace and beamed his sweet smile. “Bring on the food!” he called out while we were examining hundred-year-old mud cracks in the sand. A small bottle of toktokkie beetles was quickly brought from the vehicle. 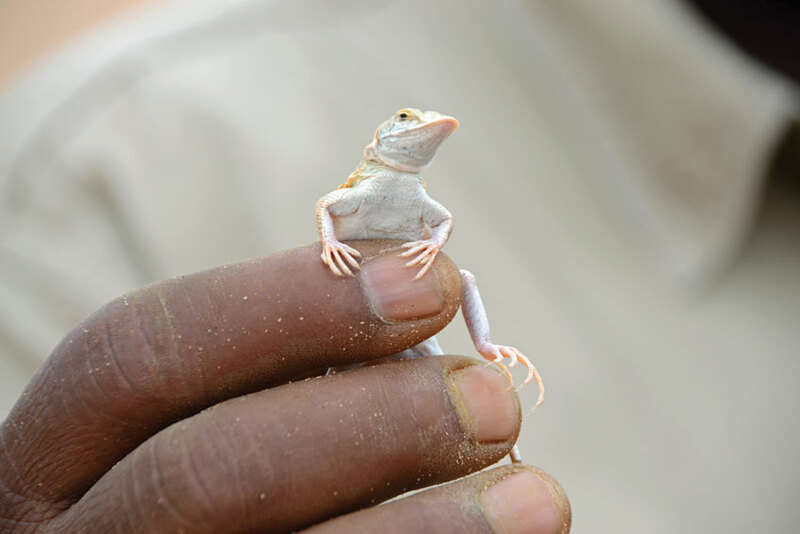 A hush descended on the desert while the small chameleon swivelled its eyes, caught sight of lunch and flicked out its tongue to catch the crunchy beetle. Cameras clicked and whirred as we zoomed in, trying to catch the incredible moment and the dance of the elongated tongue. 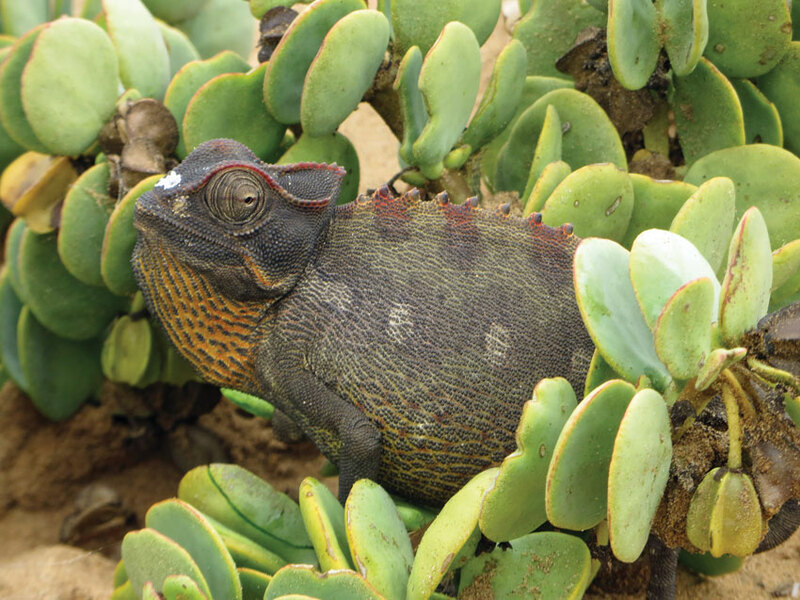 The chameleon gobbled its way through three courses of varying sizes before ambling off into the shadows. Around us the desert was silent. Life and death had flashed before our eyes, thanks to us well-meaning travellers, and we had witnessed the wonderful cycle of life in the desert. Our jewel box was full. We had glimpsed a dazzling assortment of life. Dollar-bush seeds blew among the dunes like miniature tumbleweed, the sand glistened, the sky had cleared into a friendly blue and we were replete with Namib wonders. We left the satisfied chameleon and went riding the golden waves, dipping and cresting until we neared the sea. 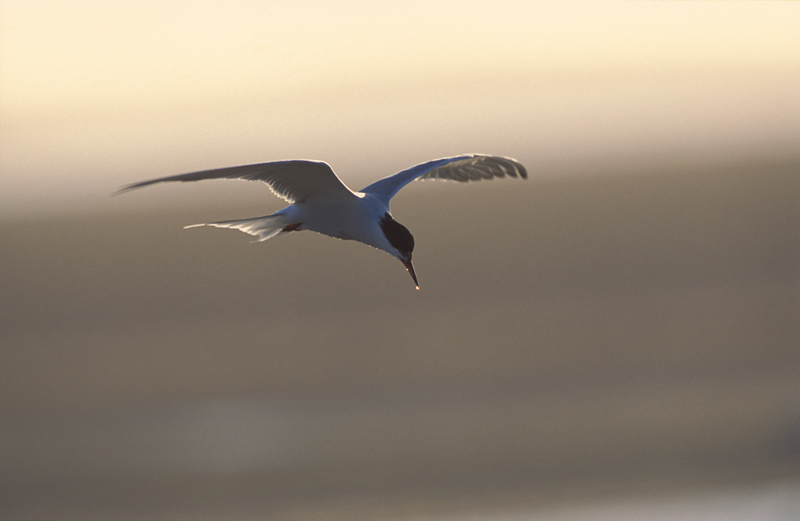 The desert also provides breeding grounds for certain species like the Damara tern. This small black-capped bird is listed as ‘Near Threatened’ because of its small population. Ninety-eight per cent of Damara terns nests between the Orange and Kunene rivers, with the largest known breeding colony being south of Swakopmund. Threats to this species include human disturbance and destruction of nests by off-road vehicles. Fenced-off areas and ‘Damara tern breeding site’ information boards between Swakopmund and Walvis Bay grant the population some protection. Keep on the existing tracks. Don’t be tempted to drive across the gravel plains. The tracks can last for decades, the soil becomes compacted, and often the flora and fauna living there are damaged or destroyed, with recovery of the area slow if not impossible. Take only photographs while you are there. 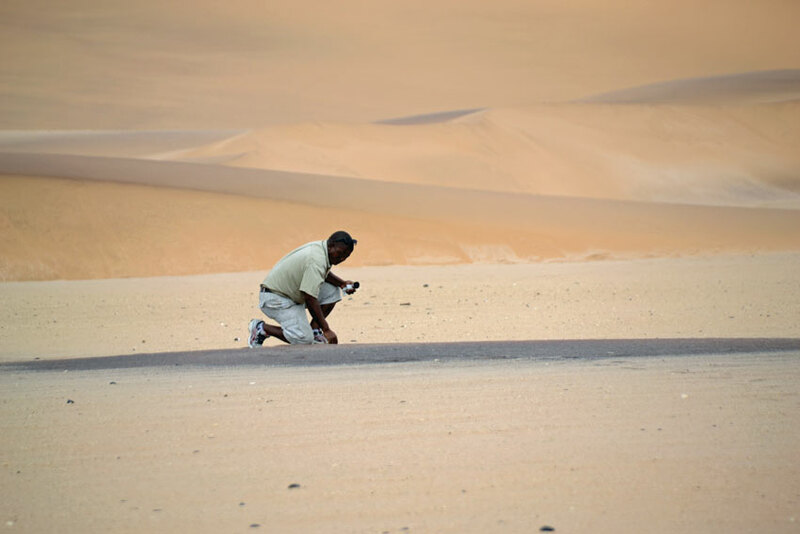 The Namib-Naukluft Park is part of Namibia’s national heritage, so collecting plants, stones or any other artefacts is not allowed. Keep shining memories and respect for the wonder of life in the desert.